- in the center-south, there is a mountain range as well, called Iberian System (Sistema Ibérico): here the climate becomes colder with increasing altitude, while rain (and snow in winter) becomes more abundant, so much so that the mountains are covered with forests. In the far north, on the border with France, we find the chain of the Pyrenees; the highest peak of the entire chain, Pico de Aneto, 3,404 meters (11,168 feet) high, is located in Aragon. Above 2,700 meters (9,000 feet) there are glaciers, which are among the most southern in Europe (together with the small Calderone glacier in Abruzzo, Italy, and the glaciers of Caucasus). 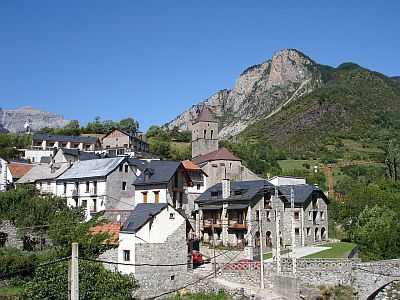 In the Pyrenean area, we find the Ordesa y Monte Perdido National Park. In the area at the foot of the Pyrenees, at the same altitude, the climate is cooler than in the south-central region; in addition, this area is exposed to cold air outbreaks, with strong winds, in winter. In Jaca, located at the foot of the Pyrenees, at 800 meters (2,600 feet) above sea level, the average temperature ranges from 2.5 °C (36.5 °F) in January to 17.5 °C (63.5 °F) in July and August; therefore, winter is cold, and sometimes there can be heavy snowfalls. Although the averages are not high, in summer there can be some hot days. In Jaca, 780 millimeters (30.5 inches) of rain or snow fall, well distributed throughout the year, with a maximum in May of 85 mm (3.3 in) and a minimum in July of 45 mm (1.8 in). The latter ir not very pronounced, since even in summer a few Atlantic fronts can affect this area, or some thunderstorms can erupt in the afternoon. In Huesca, located in the center-north, at no great distance from the Pyrenees and at 450 meters (1,475 ft) of altitude, we already enter in the semi-arid zone, with hot summers. Here the monthly average temperature ranges from 5 °C (41 °F) in January to 24 °C (75 °F) in July and August. In winter, there can be cold spells, with night frosts, and when the weather is stable, cold and foggy periods may occur; in summer, days with intense heat are possible, although the air is dry and nights remain cool. In Huesca, 485 mm (19 in) of rain fall per year, with two maxima in spring and autumn, and quite poor rains, but not entirely absent, in winter (when they are a bit more common but not abundant) and in summer (when rare thunderstorms can break out). 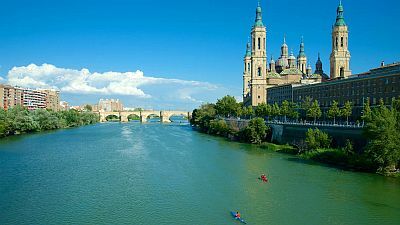 Further to the south, we find Zaragoza, located in the Ebro Valley, 250 meters (820 feet) above sea level, ie in the area where the altitude is lower, and the climate can be described as transitional Mediterranean. Here the average temperature ranges from 6.5 °C (43.5 °F) in January to 25.5 °C (78 °F) in July and August. In winter, nights are often cold, with possible slight frosts. In summer, hot days are frequent, however, the air is dry, and at night the temperature drops a lot. In Zaragoza, only 330 mm of rain fall annually; winter is particularly dry, in fact, only 20 mm (0.8 in) of rain fall each month. The amount of sunshine in Zaragoza is not bad, in fact some sunny day can occur all year round, although it is better, as happens in Mediterranean climates, in late spring and summer, especially from May to August, when sunny days prevail. East of Zaragoza we find the Monegros Desert (which is actually a semi-desert zone), where rainfall drops below 300 mm (12 in) per year. In the center-south of Aragon, the altitude rises again for the presence of the mountain chain called Sistema Ibérico, whose highest point is Moncayo (or San Miguel), 2,314 meters (7,592 feet) high. In Molina de Aragon, at 1,050 meters (3,450 feet), the average temperature ranges from 2.5 °C (36.5 °F) in January to 20 °C (68 °F) in July and August. You can notice the cold nights in the winter months, and the wide temperature range in summer, when nights remain very cool. In Molina de Aragon, average precipitation (rain or snow) amounts to 485 mm (19 in) per year, with a peak in spring, and a small amount in winter. Here is the average precipitation. Further to the south-east, in Teruel, the capital of the province, 900 meters (2,950 feet) above sea level, the average temperature ranges from 3.5 °C (38.5 °F) in January to 22.5 °C (72.5 °F) in July. In an average year, in Teruel 390 mm (15.3 in) of rain fall. The driest season here is winter. The best time to visit the Pyrenees and the valleys at the foot of the mountains is summer, in fact it is the warmest (or mildest) and the sunniest of the year. 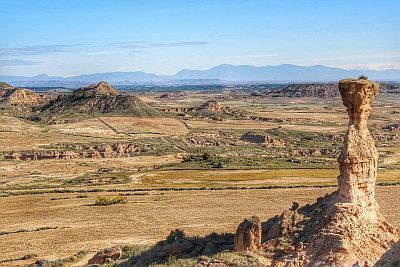 In the areas at low altitude of central and southern Aragon (see Huesca, Zaragoza), since the summer is hot, you may prefer spring and autumn (although the rains are more frequent), especially in May, and from mid-September to mid-October. Those who can stand the heat can choose July and August also in the center-south, but they should be ready to stroll around the cities in hot weather. Given the high temperature range, except perhaps in Zaragoza, even in the center-south in summer it's better to bring a sweatshirt for the evening.